World Puppetry Day is annually celebrated on March 21. The idea to celebrate this holiday belongs to puppeteer Dzhivada Zolfagariho from Iran. 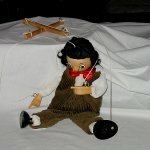 Zolfagariho made a proposal for discussion of World Puppetry Day on the XVIII Congress of the Union International de la Marionnette (UNIMA) in Magdeburg in 2000. The idea was accepted only two years later at the meeting of the International Council of UNIMA in Atlanta. The holiday was observed in 2003 for the first time. Since then World Puppetry Day is annually observed on March 21. Margareta Niculescu, the President of the International Puppeteers Union from 2000 to 2004 called World Puppetry Day, as one of the greatest rituals to praise puppet theaters. Different events are organized to celebrate this holiday in every country. Puppet shows can be presented in different forms and interactivities in theaters, plazas, communities and schools. Many countries across the world participate in celebration to praise the mastership of the puppeteers.